Internationally Published Writer, Educator, Author, medically focused Body and Energy Worker and Medical Gifted Empath. I work with spiritual women throughout the Change of Life, with help in inner transformation during their mid to later years of transition. The untimely death of my mother, when I was in my early 20’s, from a auto immune condition unfortunately misunderstood by the medical community. After my mother died I remember thinking if only I would have known what to do holistically, she may have lived. This life changing experience was the impetus for me to delve within myself and begin to live life at a much deeper, more conscious and profound level. It led me to a distinct awakening that I didn’t expect but one in which I embrace. In addition to helping those with chronic pain through Medical Massage, I began to empathically perceive the human bio-field of color and synergistically produce vibrational tones that help reset the traumatic frequencies resulting in the restorative balance of the physical, mental, spiritual and emotional fields. This holographic recalibration and Sacred Reset leads to drawing spontaneously and in the moment, the synergistic support we need for self healing… on any level needed, consciously or unconsciously. Eventually, in my journey, an unexpected interruption occurred. I was hit by a drunken driver which slowed me down by a long and cumbersome recovery with eventual depression which felt like the dark night of my soul. There was damage to my body/brain, pain, uncertainty, confusion as to why this happened to me! Of course there is a reason for every happening. I draw from my life’s purpose and destiny… my gifts and all my trials, tribulations, education, life’s experiences and especially my Trust in the Divine outworking. 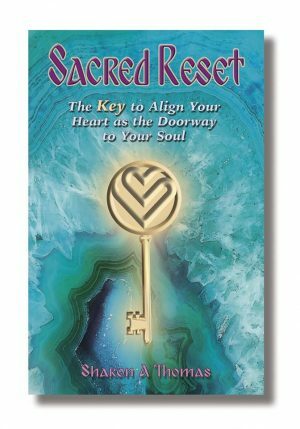 I am here to serve You and with over 34 years of experience I can help lead You into Your Highest love of Self, Soul Purpose and Calling… to Your very Own… Sacred Reset! 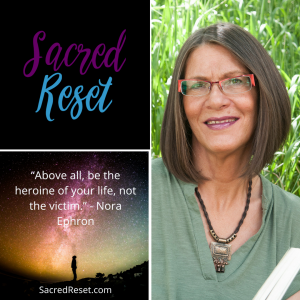 Sacred Reset begins as a Personalized, one-on-one Distance Session exploring the Process of Discovery and Renewal, led by me, Sharon Thomas, Medical Gifted Empath, Internationally Published Writer, Author, Educator.